This obverse is HOT! HOT! HOT!! This example boasts some of the HEAVIEST frost to appear on a 1956 Washington! Intense, snow-white, ULTRA+ Cameo devices grace the obverse. The reverse offers solid, frosted Cameo devices. Spot-free, haze-free, and pristine jet-black fields make this example absolutely STUNNING! 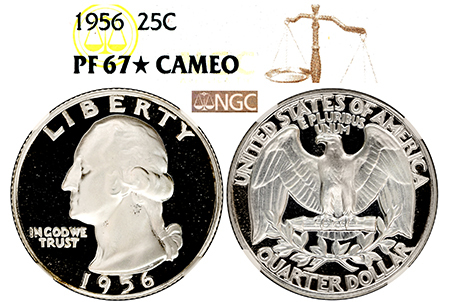 NGC certified 119 examples in PF 67 Star Cameo to date!